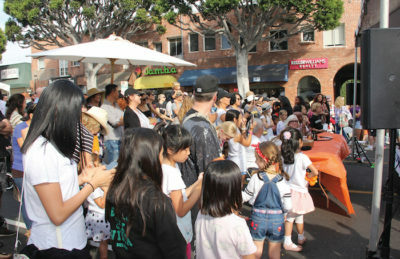 FAIRGOERS watch the Larchmont’s Got Talent show. 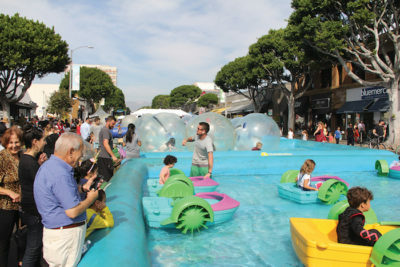 Children running down Larchmont Boulevard, lathered in bubbles from a nearby foam pit, could only mean the Larchmont Family Fair. On Oct. 28 from noon to 5:30 p.m., the Boulevard hosted its 52nd annual celebration. The fair has become increasingly elaborate since its founding. This year, a pie-baking contest was added to an already impressive assortment of activities, from a talent show to costume contest. 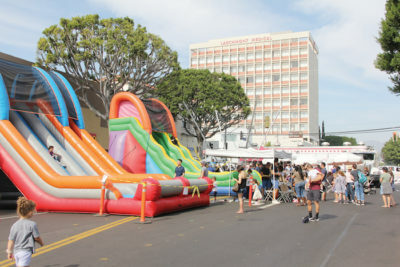 Between the In-N-Out Burger truck at Beverly Boulevard and the haunted house at First Street, over 50 local organizations and 20 rides attracted families to the street. TALENT SHOW drew a crowd. Judges are at the table. This massive operation is volunteer-run and is coordinated by co-chairs Betsy Malloy and Vivian Gueler. Malloy coordinates the production of the Fair, while Gueler manages the administrative and economic elements. They are members of the Larchmont Boulevard Association (LBA), which sponsors the fair. For Malloy, preparations for next year’s event have already started. She needs to book the most popular attractions to ensure their availability, which this year included the Bubble Rollers, Triple Lane Slide and Double Lane Slide. Malloy orders the attractions through Emerald Events, but she also researches new attractions online and keeps year-round contact with a fair-planner. WATER RIDES, ponies, a haunted house and inflated slides were among attractions at the 2018 Family Fair. During her seven years as co-chair, Malloy has been tinkering with the Fair’s attractions to strike the right balance of fun and efficiency — from adding In-N-Out to removing the camel rides. “Since I’ve done it, it looks really well organized. It just has an artistic flair to it…I mean, it’s well-organized now because it has taken seven years,” Malloy laughed. While Malloy handles the attractions, Gueler is largely responsible for soliciting sponsorships. She begins by approaching local companies and business owners who have donated before, such as Paramount Studios, Ritz Cleaners or the Rhodes School of Music. The hard task is recruiting new sponsors. In exchange for their support, sponsors often receive visibility in Larchmont Chronicle ads or promotional material, such as the large “step and repeat” banner present at the fair. 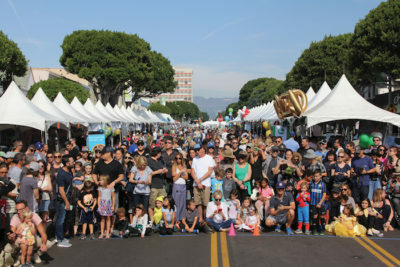 THIS YEAR, a record number of 52 vendors, representing schools, nonprofits and some restaurants, lined Larchmont. Costs mount up, starting when John Winther, president of the LBA, applies for three permits at City Hall: fire department, police department and street closure. The fire department and police permits are relatively new. When he was in office, former Los Angeles Councilmember Tom LaBonge obtained waivers of all city costs for prior fairs. Among permit requirements for the fire department is keeping at least one open car lane down the block for emergency access. 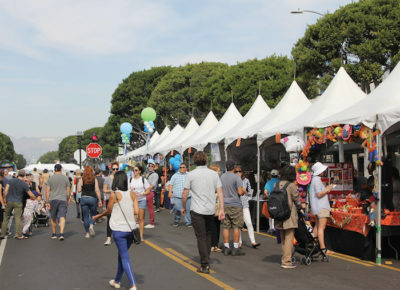 The fair’s fire lane runs along the east side of the street, which explains why the vendors’ tents are placed far from the curb. The police assign off-duty or retired officers to join SSA Security in monitoring the street. Tickets cost $3 each, and with an estimated attendance of 8,000 to 10,000 individuals, ticket sales contribute toward covering the event’s other costs. The LBA and vendors must be covered by insurance for the fair. The LBA has its own insurance, but part of LBA member and State Farm Insurance agent Leisha Willis’ role is ensuring that new vendors have the fair specifically added to their insurance coverage. The LBA hires street cleaners, independent from the city, to clean the street after the Fair. Malloy also hires four men to clean the Fair as it progresses, from 6 a.m. until 9 p.m.
“It’s cleaner the day after than it was the day before,” Gueler added. Beginning at 5 a.m., at least 20 workers from a party rental company begin setting up the tents. This year, tents for a record number of 52 vendors (from schools to restaurants to nonprofits) were erected, as well as the main stage tent and ticket booth tents. This process usually takes until 11 a.m.
“The motive for the fair from the year it started, years ago, has been to allow the different schools in the area to put on a fundraiser. In other words, each one of the canopies lined up are all provided by us, but we let a school come in, and the school has the choice of advertising the school, and they take all the profit,” Malloy said. Each tent-user is charged a fee to cover the cost of its tent. Schools choose to fundraise through different means, with the most popular being shaved ice or popcorn, which require generators. The LBA covers the cost of the generators, but it invariably leads to the reshuffling of tent arrangements as schools need to be near the generators — or far away, as the machines are quite noisy. “I run around like a chicken with my head cut off in the mornings. We kind of oversee the setup, from all the tents to placement of everything,” Gueler said. The rental workers come back around 6 p.m. to begin tearing down the Fair. At the end of the day, the Fair generates unknown profits for the tent participants, and approximately $8,000 in profit for the LBA. Most of those earnings go toward covering LBA annual expenses and supporting local nonprofits. The LBA also contributes toward holiday decorations, such as the red ribbons adorned on the ficus and tulip trees lining Larchmont Boulevard. Although the Fair may be over, the community is still enjoying the results of a fun and well-planned afternoon the last Sunday of every October. By Talia Abrahamson, a junior at Marlborough School.